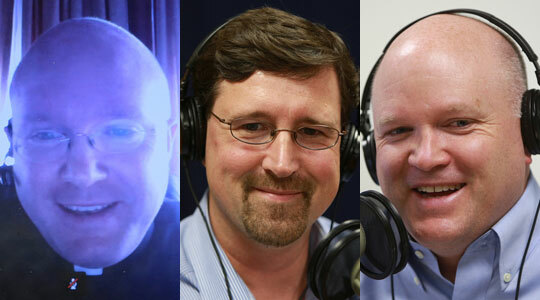 Summary of today’s show: Scot Landry, Gregory Tracy, and Fr. Roger Landry discuss the news headlines of the week, and despite the holiday and the Pilot being on hiatus, it’s been a busy week. This week the Fortnight for Freedom ended with a Mass in Washington, DC, in which Archbishop Charles Chaput gave a remarkable homily; bishops reacted to the Supreme Court’s decision on the healthcare reform law; a significant appointment at the Vatican; an expression of papal confidence; and the Vatican gets media savvy. Due to a technical glitch, the first few moments of the show were not captured for this recording. We apologize for the inconvenience. Scot said the Fortnight for Freedom ended yesterday and the big closing event was a Mass in DC at the National Shrine of the Immaculate Conception. Archbishop Charles Chaput of Philadelphia delivered the homily. Greg said Chaput focused in on “Render unto Caesar what is Caesar’s and render unto God what is God’s”. In the end it’s not about trying to strike a balance between the two worlds. We belong entirely to God and that is where our allegiance belongs and from which we get our freedom. Scot said a lot of people focus in that reading on rendering to Caesar, but the real focus is we should render ourselves in our entirety to God. Fr. Roger Landry said Chaput went far beyond his book on the same subject. Because we are made body and soul in God’s likeness and image, and because we owe the icon to the original, we owe ourselves to God. He said freedom is not just independence, but also a dependence. We have both freedom from, but also freedom for. We have to use our real freedom for God’s cause. Fr. Roger thought it was a theological tour de force. He was calling Catholic Americans to use their freedom for good in such a way as to revolutionize our country anew and return us to what made us great in the first place. While religious liberty “is a foundational right” and “necessary for a good society,” it is not “an end in itself.” Rather, it must be used to find and live out the truth in order to attain to holiness, the highest form of freedom. This higher form of freedom, found through God’s grace, “isn’t something Caesar can give or take away,” Archbishop Chaput taught. We live in a time that calls for sentinels and public witness. Every Christian in every era faces the same task. But you and I are responsible for this moment. Today. Now. We need to “speak out,” not only for religious liberty and the ideals of the nation we love, but for the sacredness of life and the dignity of the human person – in other words, for the truth of what it means to be made in the image and likeness of God. We need to be witnesses of that truth not only in word, but also in deed. In the end, we’re missionaries of Jesus Christ, or we’re nothing at all. And we can’t share with others what we don’t live faithfully and joyfully ourselves. When we leave this Mass today, we need to render unto Caesar those things that bear his image. But we need to render ourselves unto God – generously, zealously, holding nothing back. To the extent we let God transform us into his own image, we will – by the example of our lives – fulfill our duty as citizens of the United States, but much more importantly, as disciples of Jesus Christ. Scot said every generation needs public witnesses who alert people. We need to speak out. Greg said he was struck that beyond speaking out, we need to draw ourselves closer to Christ and thus be an example to others. There was a way in which Mother Teresa’s way of being Christ-like changed the minds of people she encountered without speaking a word. Scot clarified said “render” means to return or to give back. For all the blessings we’ve been given by God, we need to give it all back to God 100%. Scot asked Fr. Roger about “Either we’re missionaries of Christ or we’re nothing at all.” Fr. Roger said if we’re a true disciple then we’re trying to bring Christ and his kingdom to others. Fr. Roger said “surrender” is an intensified “rendering”. The biggest aspect of the Fortnight for Freedom is that if we’re going to be defending religious liberty, we need to be a religious people. Turning to the next story, Scot said last Thursday the Supreme Court decision about the Affordable Care Act, Obamacare, came down, and some commentators thought the bishops’ response should have been stronger. The bishops’ statement said they support universal healthcare and asked for modifications to the law. Greg said the bishops’ have been consistent in their message; it just hasn’t been well understood. The bishops have urged for an expansion of healthcare without dictating how it should happen. But they said it should be done in a way consistent with respecting conscience and freedom of religion. The reason they’ve been speaking out so much is that this lack of exemption for religious conscience is sour of character of every other law that’s been passed. The way the narrow exemption has been written in such a way that the only major institution affected by this is the Catholic Church. Fr. Roger said when you look back over the whole debate, the bishops have always been in favor of most of the provisions of the law, so when they came out against it, it was for the specific lack of exemption. That’s why they hadn’t joined the lawsuits that resulted in last week’s decision. The other lawsuits from Catholic organizations over the HHS mandate continue on. Fr. Roger said there are many issues in play and the US bishops have always been clear in what parts they favor or oppose, but that doesn’t always show up in newspaper articles. 3rd segment: This week’s benefactor card raffle winner is Charles Ford of East Walpole, Mass. He wins the book To Whom Shall We Go? by Cardinal Timothy Dolan of New York. 4th segment: Scot said there were some big appointments in the Vatican recently. One of the biggest was the appointment of a new prefect of the Congregation for the Doctrine of the Faith, Bishop Gerhard Mueller of Regensburg, Germany. Fr. Roger said Mueller had been mentioned for the past year as a candidate. He’s brilliant and written 500 books on theology. He’s a very clear writer, just like Pope Benedict is. Recently, he’s been editing the complete works of Pope Benedict’s articles and books into a definitive edition that will be read by scholars for centuries. He’s also been controversial for his friendship with on the leading liberation theologies in South America. Liberation theology has been criticized for preaching political revolution, especially of the Marxist variety, for spiritual salvation. Cardinal Ratzinger had been very influential on suppressing the bad liberation theology. Fr. Roger thinks it will help Bishop Mueller engage liberation theology and other theologies that are outside orthodoxy. Pope Benedict’s last proferrship was in Regensburg and his brother served in that diocese. Cardinal Levada, who was head of the CDF from 2005 to now, had been brought in for expertise in dealing with abuse cases. Fr. Roger said Bishop Mueller will be able to take on a lot of the theology work that Pope Benedict has been continuing and now he will be able to move on to a new agenda for himself. Scot noted that this is someone who will know Pope Benedict’s writings better than anyone else. Greg also said it was notable that a German pope has picked a German bishop to head the CDF. He said ultimately we want to see someone who acts as Pope Benedict would act. We don’t want a curia full of people working toward their own goals with their own agenda. Scot said most people would say this CDF is the number 3 position in the worldwide Church, after Pope and Secretary of State. Fr. Roger said the Secretary of State has influence throughout the world through the foreign ministry, as well as all the Vatican administrative staff. He said the work of the CDF will have the most influence in the future over the centuries. Scot said before going on Vacation Pope Benedict released an unusual letter affirming the work of Cardinal Bertone. This is in response to the Vatican leaks scandals and accusations of mismanagement or other incompetence of Cardinal Bertone. Greg said Americans generally don’t appreciate the doggedness of the European tabloid press. Fr. Roger said it was unprecedented, especially in that Pope Benedict has never released a personal letter he’d written to anyone else expressing personal confidence in them. Cardinal Bertone is very Italian and there is within the curia, a lot of Italian prelates with an old boys’ network and some have said the scandals have attacked this network. Fr. Roger said he thinks there needs to be a personal defense of Cardinal Bertone if the press would focus not on the person, but on the principles being questioned in the Vatican leaks. Fr. Roger said Bertone has been well regarded in the past. He was Cardinal Ratzinger’s righthand on the CDF. He was talented enough to do color commentary on Italian TV about professional soccer. Fr. Roger said the story has been shifted away from the leaks themselves to the person of the cardinal. Scot said the Secretary of State has created a new position of media adviser and hired Fox News reporter Greg Burke. Scot said he’s surprised that the Vatican has recognized the need for this; that they’re hiring an American; and that the position is placed within the Secretariat of State. Greg said it’s understandable they hired an American with the leadership role that America takes in communications principles and that English is the common language of the world. He sees the need for this because the Church can become insulated from the world and not savvy enough to know how something outside of its context can be misunderstood. Fr. Roger said the Vatican press spokesman said the Press Office reports to the Secretary of State already so that’s why the media adviser is in that dicastery. Fr. Roger said he knows Greg Burke and recently ran into him in an airport a few weeks ago. Greg didn’t say anything at the time. Fr. Roger said Burke will help with crisis communications and will help with breaking news, for example, helping members of the media can get the embargoed documents in advance so the breaking news stories are less shallow. Fr. Roger also said Americans think differently about crisis news. We acknowledge that reporters will eventually get the story so we need to be able to frame the narrative in advance. Scot noted Greg Burke said No to the job at least once. “I had a great job at Fox, just the right mix of time in Rome and travel; I was in my comfort zone,” he said. It took him some time to “get the courage up” and take the chance rather than risk living with the nagging feeling he could have been able to make a difference, he said. In the Anchor this week, the Fall River diocese offered its third annual Quo Vadis retreat for teen boys. Fr. Roger said it’s a help to the young men to be formed in order to have the inner strength to listen to the Lord’s call for their lives. That last few years they had good numbers and they’re expecting to exceed the numbers this year. There have been 30 or 40 ordinations in other dioceses from these days. In Harrisburg, they have 150 young men at their retreats. Quo Vadis comes from early Christian tradition about St. Peter escaping from persecution in Rome. Peter encountered Jesus on the road and asked him, “Lord, where are you going?” (Quo vadis, in Latin). Jesus said he was going to Rome to be crucified again. Peter knew that Jesus was to be crucified in him. The Quo Vadis retreat helps the men ask the question of where the Lord is going in their lives. Scot and Greg talked about the Pilot being on hiatus this week and the next and what they’ve been up to. The Pilot’s website is being updated with current news during the hiatus.